The youngest of the four tyre manufacturers currently in high level karting, LeCont was founded in 1994 out of the passion of the Cont brothers. Pragmatically in 2013 LeCont took the different steps one by one to access the KF-Junior category where they won the CIK-FIA tender. 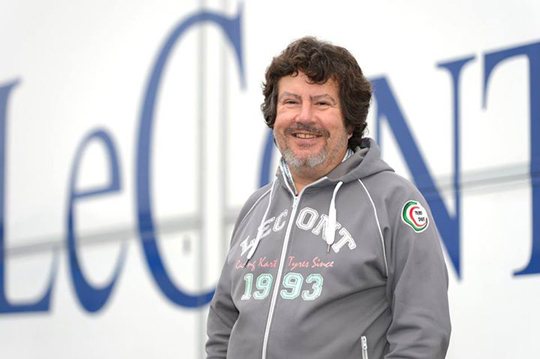 "2013 was an important year for LeCont," said Paolo Bombara, the commercial director of the Italian brand. "After our entry into the circle of manufacturers selected by the CIK-FIA with the 2011 Academy Trophy, this year we have provided tyres for the KF-Junior European and World Championships, of which we are proud. "We had a little apprehensive initially to meet the drivers and teams who are often attached to their benchmarks, but all went well. Our tyre is not necessarily the fastest, but everyone runs in the same conditions and we have proven ourselves in terms of longevity and consistency. The debate will never be settled between grip and the durability of a race tyre. Drivers want maximum grip, but they are also the first to complain about spending and lack of stability over time. We always make compromises and we fully defend our choices. "In this regard, the direction taken by the CIK-FIA for 2014 seems excellent. The tyre tests showed that at Sarno most manufacturers could meet the requirement set: 150 km and 250 km for Prime and Option. The fact that some drivers have no financial limit in using new sets of tyres in testing gave tyres a bad reputation. I think it is not at all necessary to abuse them. I am well placed to know that it is not those who consume the most tyres who are then in the top places. Instead, it is important that a driver gets used to working with old tyres because that is how it happens in the race. "LeCont wishes to remain present in the CIK-FIA competitions. We were delighted to supply tyres for KF-Junior, one of the most popular categories, but we want all the categories."